This Tony-award winning musical of the 50’s is an American classic. Based on Al Capp’s politically and socially satirical comic strip, its humor and commentary have uncanny relevance today. The story centers on Dogpatch’s Sadie Hawkins’ Day Race, the annual opportunity for Daisy Mae to once again attempt to snag Li’l Abner for her husband. But the race gets interrupted by Washington D.C. bureaucrats who announce that Dogpatch has been determined to be the most unnecessary town in the USA, and thus has been selected as the site for testing the atomic bomb. Told they can only avoid evacuation and annihilation by demonstrating that the town has some redeeming value, Mammy Yokum throws her secret Yokumberry tonic into the mix, the plot thickens, and the madCapp ride takes off! 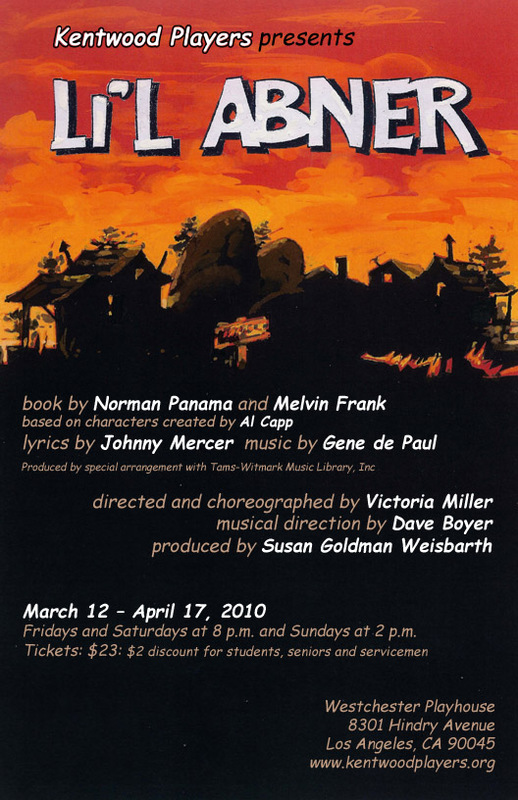 Featured in the cast of Li’l Abner are (from left) Margie Bates, Jeff Asch, Derek Rubiano, Meredith M. Sweeney, Greg Abbott.